I recently have been immersed in reviewing “Integral Recovery,” including the brand-new book of the same title by psychologist John Dupuy; as well as the integral theory by Ken Wilber upon which is based this newly articulated, highly comprehensive approach to recovery from addiction. In my studies, I have come in contact with Wilber’s Integral Life Practice, including what is called the “Integral Life Practice Starter Kit,” consisting of several DVDs, CDs, booklets, and other supportive reading material. Each DVD and CD teaches practice in one of Integral Life Practice’s four core “modules”: body, mind, spirit, and shadow. (More details are available at http://integrallife.com.) I began by viewing the DVD (from this “kit) by theory originator, Ken Wilber, as he introduced the “mind module” for integral theory. What follows is my beginning summary of his ideas, particularly as they might apply to recovery from addiction. Wilber, and his student, John Dupuy, begin by looking at recovery and addiction counseling through four different, possible lenses. We can view addiction and recovery from both objective and subjective perspectives, as well as on an individual vs. a collective basis. 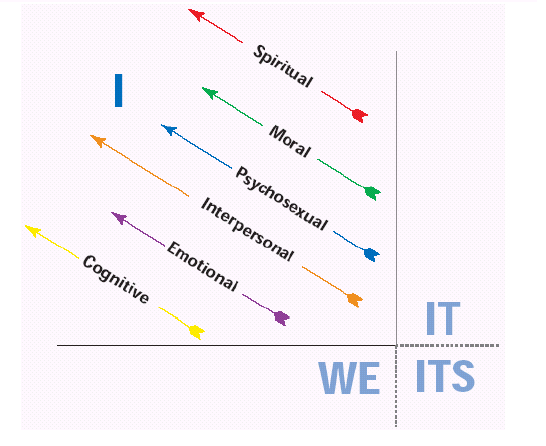 Thus laid out, the upper right-hand quadrant represents what empirical science can tell us objectively about the individual’s addiction (e.g., physical health and neurobiological imbalances). The lower right-hand quadrant, on the other hand, explores objective factors affecting the addicted individual’s collective adaptation, or life in the world (e.g., financial difficulties and legal involvements). 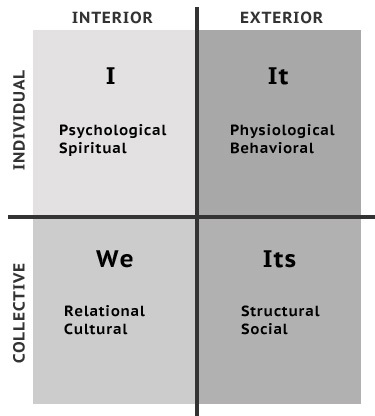 If we move to the lower left-hand quadrant, there we find the intersubjective dimension (e.g., family relationships, as affected by the addicted individual’s behavior). Finally, we arrive at the upper left-hand quadrant, which addresses the interiority, or subjective experience, of the addicted individual. Also, Wilber and Dupuy maintain that it may be helpful to both review, and expand upon, one of the most common approaches to addiction counseling: namely, the biopsychosocial model. Harvard educational psychologist, Howard Gardner, developed a theory of “multiple intelligences,” or developmental lines. The aforementioned biopsychosocial model addresses several of Gardner’s developmental lines of intelligence, including: bodily, cognitive, emotional, and social intelligences. Insofar as spirituality points toward that which provides value, meaning, and purpose in our lives, recent psychological research clearly indicates that the recovering addict’s spirituality may strongly contribute to his or her healing from addiction. It makes sense then, from an integral perspective, to suggest an expanded, more comprehensive model of addiction treatment: a biopsychosocial-spiritual approach. Wilber and Dupuy believe that for psychologists and other mental health counselors, whether religious by background or not, the addition of spiritual resources to the overall approach to counseling recovering addicts is essential. Wilber, K. (2007). The integral vision. Boston: Shambhala. Not only is “spirituality” essential, it is virtually impossible without it. Yet, it cant be measured, quantified, known, or thought of. I have practiced the 12 steps made famous in AA and find it to be the best “model” available.